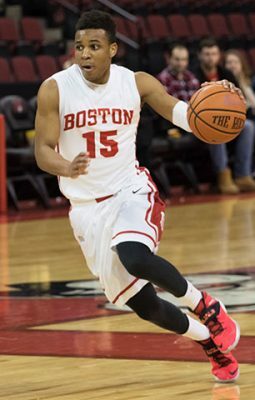 Losers of its last three contests following a season-high five game winning streak, the Boston University men’s basketball team looks to rediscover its winning ways when it hosts the United States Military Academy Wednesday night at Case Gym. The Terriers’ (10-10, 5-3 Patriot League) recent struggles have dropped them from atop the league standings and into a tie for second along with Lehigh University and the United States Naval Academy, trailing leader Bucknell University. As BU head coach Joe Jones sometimes pointed out, BU has had trouble imposing itself on opponents when it has difficulty making shots. In its past three games, the Terriers have made just about 38 percent of their shots, while their opponents are making about 46 percent of their attempts. In BU’s most recent matchup against the Bison (15-6, 7-1 Patriot League), it allowed Bucknell to make 52.2 percent of its shots en route to a 70-59 defeat. Another possible hindrance that has hurt the Terriers as of late is the absences of senior center Blaise Mbargorba, junior guard Cheddi Mosely (9.2 points per game) and freshman guard Destin Barnes (40 percent behind the 3-point line). Coach Jones cited the trio’s situation “as an internal matter,” which has kept Mbargorba off the court since Dec. 7, Barnes since Dec. 10 and Mosely since Dec. 18. It appears as though BU will be without them again against the Black Knights (8-12, 2-6 Patriot League) on Wednesday night. Contrary to its below-average overall and conference record, Army’s performance this season is not as poor as its record suggests. Only three of the Black Knights’ losses this season were double-digit defeats, which were at the hands of then-No. 5 University of Oregon, Monmouth University and most recently Navy (10-10, 5-3 Patriot League). In addition to losing five of its contests by at most five points, Army’s bad luck at closing out games is the difference between it being a contender and where it is now as the second-worst team in the Patriot League, only ahead of Lafayette College. The Black Knights also play better at home than on the road. They possess an even 6-6 record at the friendly confines of Christl Arena, but are just 2-6 when traveling outside of West Point, New York. The Terriers will have to limit the scoring of Army’s two leading scorers, guard Jordan Fox (12.2 ppg) and freshman Matt Wilson (10.9 ppg, 5.2 rebounds per game). BU will also need to negate Army’s league-leading rebounding prowess (37.8 rebounds per game) and make sure its two-leading rebounders senior Mac Hoffman (team-leading seven rebounds per game) and Wilson stay off the boards by boxing out. Although the two teams have yet to meet this season, Jones expects for the away side to come out energized and on the attack, and the Terriers will have to match Army’s intensity if they want to win. You can only call it an “internal matter” for so long. Are they on the team anymore or not?